Do you really enjoy life? At mylot we are such a big family of nearly 1,84,000 members coming from various parts of the world. We are here sharing our views on different topics. We are concerned about each others various types of problems and trying to solve through discussions and responses. We are all responsible members of our individual families trying to better the standards of our immediate family through various means of earnings. In the midst of all these do you really enjoy life? If so how? Alone or with family? To be very frank, I do enjoy life with my family and friends. Every day after the office hours it is fun time at home. Sunday is the biggest festival day at home with friends coming for lunch. In the evenings all of us go out for either shopping or movies or just casual walks. Once in a while all of us go for sight seeing in our city. There are many places in the city worth visiting and all the places cannot be covered in a day. So we have to keep visiting one by one with guests if any. I have seen and heard people saying that they visited so many places in the world but I dare say they must have not completely visited their own city. So enjoy the beauties of your own city first and then your own country and then think of going to other countries. Everyone of us have problems of various types. Health problems,wealth problems,educational problems, relationship problems and so on and on. We all know life is very uncertain and short so why not enjoy our life with our family to the best of our abilities? Dear meapas, I totally agree with your views. Weekend we should spend quality and happy time with our family. My family and I will go for movies and lunch or window shopping at a nearby mall. To add some special touch for the outing, we at times do crazy thing like 'movie-marathon' or 'eating-thon'.. Join some activities in the mall - Valentine, Mother's Day, Father's Day and some fun activities. I tried to balance out for vacations - in Malaysia we have three school four school holidays. March and August have 1 week school break each. I will take this opportunity to go back my hometown and my husband hometown too. I believe our parents will be please to see their children and grandchildren. We will take a day out there to go local attractions. IN the Month May to June, there will be 2 weeks school break which I will try to plan for a local holiday to Island/ Beach Holiday in Malaysia itself. If not, we will try to visit neighbouring countries like Thailand, Singapore or Indonesia. We still have not covered Langkawi Island and East Malaysia~ Sabah & Sarawak..(must start to plan now:) IN the month of November to December, the school will have a long holiday which is 6 weeks. This is the holiday season and Christmas decorations all over...we will plan for overseas trip to other continents like South Africa, Europe, Australia or the US. 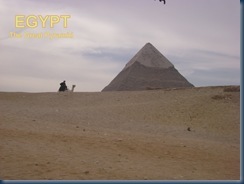 But with H1N1, I doubt we are planning any overseas vacation.. A picture of my family trip to Egypt, photo taken by my son. All the best, I truly hope to visit the Taj Mahal one day with family. WOW! That is living life to the full. Enjoying life with whole family is something every one should go for. I am a big fan of such loving people who cares for every member of their family. I pray for such family and pray for other families too to get such loving persons in their family. There can't be a better news than this where you get to hear whole family enjoying life and there can't be a better sight than this where you can see a complete family enjoying life to the fullest. I just enjoy hearing and seeing this. If only every family in the world live life like this what a lovely place the world would have been. You would get to see a real heaven on this earth. What a dream? Is n't it? My time at mylot.com has always been fruitful. Thinking back of the many things and knowledge I have learned, it is probably the cheapest online education on life. Just like in mylot, I want to enjoy life. I want to create the lifestyle I desire. That's why I decided to be an entrepreneur. Yes mylot helps in many ways so keep enjoying mylotting. Keep trying and you will get what you want but be happy with what you have. Thanks for your response. I have to say I am happy with my life inspite alot of things happening to me, I can say I am satisfied. I can do better but one day at a time is all I can do. I am hoping that things would be better. But I thank God that my family is complete and I am very happy with what I have. So happy to hear that. We should be happy with what we have. If we appreciate what God gives us then He will give more. Thanks for your response. hi meapas, i am happy now. i am contented of what i have now. even if we are not taht rich, butstill we are happy and always ready on everyday story in my life.. i am always ready to face the problems on my life.. i am always thankful to GOD for everything.. enjoy life to the fullest and be contented of what you have.. have a nice day ahead and happy myLotting.. janebeth. Yes we have to thank God for all that He has given us. Without His help nothing would have happened for us. He is our inner strength to face any problems in life. Thanks for your response and keep enjoying every moment of your life. I am so happy to hear this. You are very right. When your family is happy and healthy, it gives you more happiness. Hope you keep enjoying your hobbies too. I truly do enjoy life....with my family and friends.....and sometimes at home by myself. I love doing crafts...taking nothing and making something out of it.....I enjoy traveling especially to see my daughters which don't live very close to me.....my son and his family and I bought a camper that's on a permanent spot so we can spend our weekends camping togehter.....so I have alot of thing that make life very enjoyable! So nice to hear that. You are really making life very meaningful for you and for others. Hope you keep enjoying life and make your near and dear ones happy. hi meapas although right now I am not where I would want to be'I am where I have to be for now,so yes why not enjoy my life right here' right now. crying over what might have been just makes your eyes'red and your nose runl;so why not laugh and hope that one day soon things will be different. so for now i will enjoy mylot friends and my friends here at Gold Crest. One of them talks such silly stuff it makes me laugh inside andd that is good as I am not laughing outloud at him at all. Yes it is true. Though we are not where we would like to be but enjoy what we get. Thanks for your response and you keep enjoying every moment of your life where ever and in which ever company you are. I am always take things easy. I live life one day at a time. I love to relax, read newspapers, watch movies, small chats, read spam mails...LOL Oh yes, I do bring my family for holiday locally and overseas. Normally my wife is the one initiate it :) It is good to have quality time with family, in will encourage family bonding! So nice to hear that. A loving family is the most precious gift from God. So one should enjoy this to the maximum in the warmth of family bonding. I do agree with you. Also, life is a gift from God. Life is struggling. We should thank to God for everything given to us, strength and weakness. Yes we should be thankful to God and our parents for giving us this life. We should also be thankful to all those people who taught us so many good things in life because of which we are aware of good and bad. So just enjoy every moment of your life with all its offerings. i have many problems going through right now, sometimes i just want to back off and leave everything behind. But i cant do that i need to be strong, despite of all the hardship that im going through i stll enjoy my life because i am still lucky compare with others. If i feel down, i just count my blessings and it makes me feel good. Think of all those less fortunate ones. So enjoy as much as we can. Life is too precious to keep worrying all the time. Let us spread love and happiness where ever we are. I have not been able to enjoy most of my life. I have tried to but it seems to be impossible. I try to make the most out of each day though and just hope it gets better with my thoughts and all. Happiness can be found in simple things of life. Just look at your avatar. So innocent and beautiful creation of God. A simple and loving. Just by watching your pet can give you that moment of happiness. So let us be happy with what ever we have and let us spread happiness and love where ever we are. Everybody also have their different ways to enjoy life. Somebody will choose to travel. Somebody will choose to go for music. Somebody will like hiking. There are endless list of enjoyment you can have in your life. It seems cheesy but I take a look at my life and realize how lucky I am to have what I have and I appreciate it. I appreciate every second with my boyfriend, I smother our daughter, I enjoy conversations with the people I find to be my real friends, etc. I think the key is appreciating your life. Yes there are many types of enjoyments. Enjoying with family is the greatest. Thanks for your response. Hope you get what you want very soon. Keep trying and enjoy every moment of togetherness. Thanks for your response. I did say it. Thanks for taking time out. im enjoying my life as well as i can. after i have lost someone very important i find out that the past time i've spent for nothing is really a huge waste. Let us all live in the present and enjoy every moment of it. Past has left us for ever so only try to remember some memorable moments of it and enjoy. Let us all look forward to a better future while enjoying our present and working towards our better tomorrow. Not really,Im Fed up with life.And i mean BIG time. Do not worry. A time is marked for every one. God is great. Believe in Him and believe in your self. Let us not get fed up and waste our precious moments of life. Time and tide wait for no man so let us enjoy with what ever we have. Hello, Yea I sort of enjoy my life, I mean it could have been better with more money and enjoyment, but it is still good. Who knows, it even could have been much much worse, with no food or water like some other people who live in this world. Make sure you have a good day, God bless and Happy Lotting! !